March | 2013 | Relaxed. Transitioning. Natural. Beautiful. Hello, my fellow Curly Cuties! It’s been a month since I Big Chopped. Out of curiosity, I wanted to see how much my hair has grown. Post my Big Chop, most of my hair was 3.0 inches long with my shortest strands (on the side of my head) at about 2.5 inches. In four weeks’ time, my hair grew (wait for it …) a whole inch! I could hardly believe it. An entire inch in just one month! 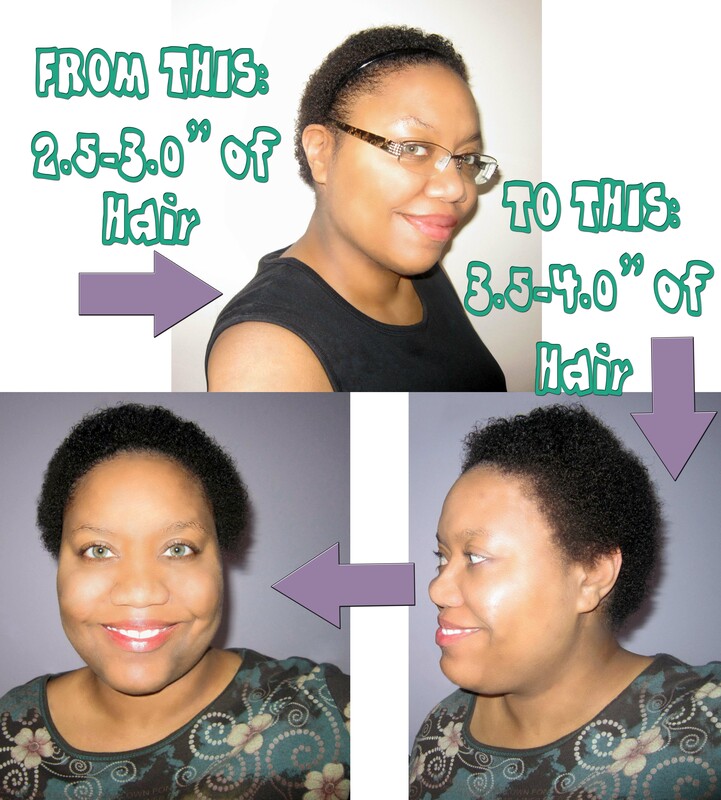 When my hair was relaxed, I would be happy to get a 1/4 inch of hair growth each month. Most times, if I was lucky, I just managed to maintain the length I already had. Other times, I was a little less lucky and experienced hair breakage. So, I am ecstatic about an inch of growth in a month. And, for all those type-A personalities out there, like me, who are looking for a way to systematically chart their hair growth, check out Shastrix’s advanced Excel spreadsheet for “Managing Hair Growth Data” HERE. Her creation makes charting your hair management data a breeze. From the graphs that display your hair growth rate and length goals to the calculations that help you find your terminal length, there is plenty to please trichology nerds and hair divas alike. If you are not confident with Excel, don’t worry. Just stick to only editing the GREEN highlighted cells. The first time you use the spreadsheet, all you have to do is input the lengths required to reach your various hair goals in the appropriate column and update your spreadsheet as you do length checks. Over time, it will even determine your average rate of hair growth. Just make sure that you are consistent in how you measure to receive accurate results. I gotta say, I’m looking forward to what the future holds … twist outs beware!